I would have cleared that stop sign. It started with dog piss in the shower and continued to go south the rest of the morning. While unloading, I discovered that the battery was dead. The wind was light and forty five degrees off the runways. The plan was to launch into the intersection and turn down the runway. The wing was a little behind my turn and the outside tip steering line caught the top of the stop sign and popped the tip right off. I felt it and immediately aborted. I honestly think I could have hammered the throttle and launched only to find myself flying a badly compromised wing. The left side would have had very low pressure and who knows what would have happened. Anyway I aborted and the only damage was to wingtip and a couple of lines. 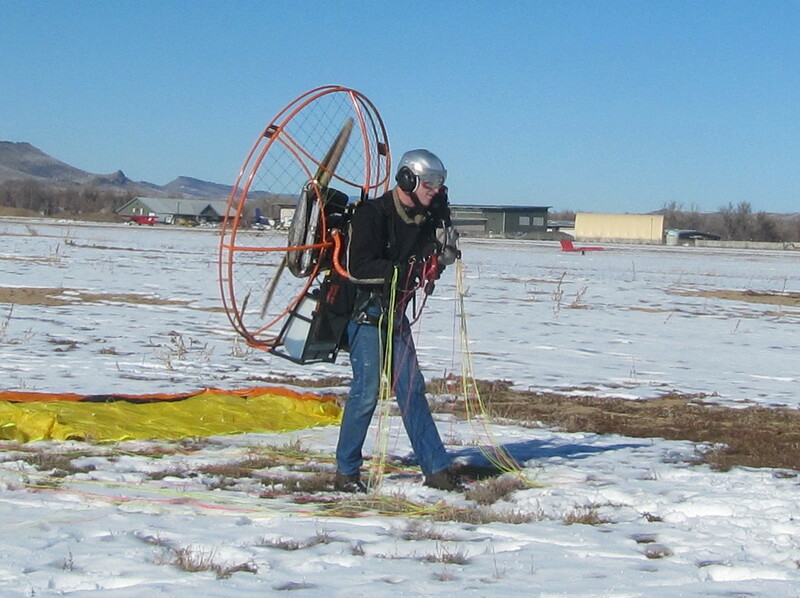 Elisabeth is months out and Paramotor City is 6 weeks, so it’s going to be awhile. Tonight I picked up a Paramania Revolution 36 for a decent price. It’s a couple of years old but very low hours. I was worried that 1000 was going to be underwhelming … the wait is going to make it special. 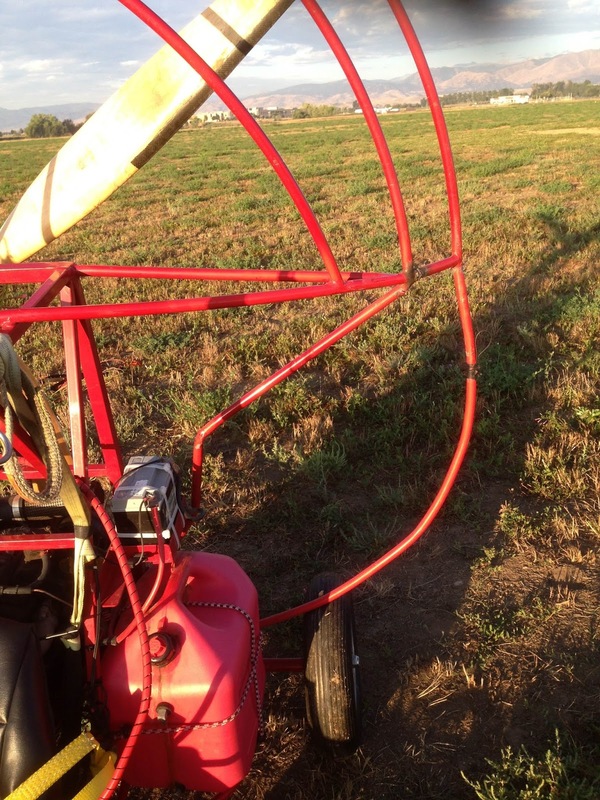 Author JoeOPosted on August 30, 2017 August 30, 2017 Categories Dumb Chute Story, equipment damage, Incident equipment damage, log entry, Milestone, milestones, new site, no fly dayTags powered paraglidingLeave a comment on No Fly Day. Perfect morning, warm, clear, zero wind. The streets at Placida had just been repaved. I had a full tank of gas and a belly full of coffee. The battery was dead and the mini charger couldn’t turn it over. So, I positioned the truck to jump and …. then…. discovered that the hard landing last flight broke loose a weld. Two strikes and time to call it a wrap. This is the second line strike in a month. I think it’s happening because the line keepers on the cage are holding the lines tightly together. When the A’s are immediately tensioned they might be throwing other lines out of the keeper while they are still slack. The outside may be very slack. The chevron layout exacerbates this and one part of the cure may be to layout the wing in a slight curve. Another thing I’m going to try is to inlay a zip tie inside the keeper so that the lines are laying in the crook instead of being gripped against the cage. During inflation I heard or perhaps sensed the line strike. I didn’t immediately abort and instead kept accelerating. I looked at the lines and remarkably saw the damaged one. It was intact but the sheath was severed. That’s when I aborted. On inspection I could have continued the flight. The damaged line was the far outside Main D which does not carry a heavy load and is backed up by the brake lines. However, I could not have know at the time so it was the right thing to do. This was a disappointing morning. Bad weather and having my bride home has made it difficult to get in any flights. Last night she worked late allowing me to hit the sack early. This morning I woke 15 minutes before the alarm, jumped out of bed and arrived at the field at first light. I was concerned that I might have left the key in the ignition but …. No, it’s all good. Cranked up the theme to True Detective, loaded the wing in my lap, taxied out to the launch zone and just as I arrived I heard/felt a crack. Damned if the nose wheel hadn’t collapsed! The last flight was normal with a normal landing. I’m not sure if it had been damaged for awhile or if it rotted from the inside or I banged it into the earth on landing and just didn’t notice. I’m off to San Fran tomorrow and will just have to deal with it when I get home. 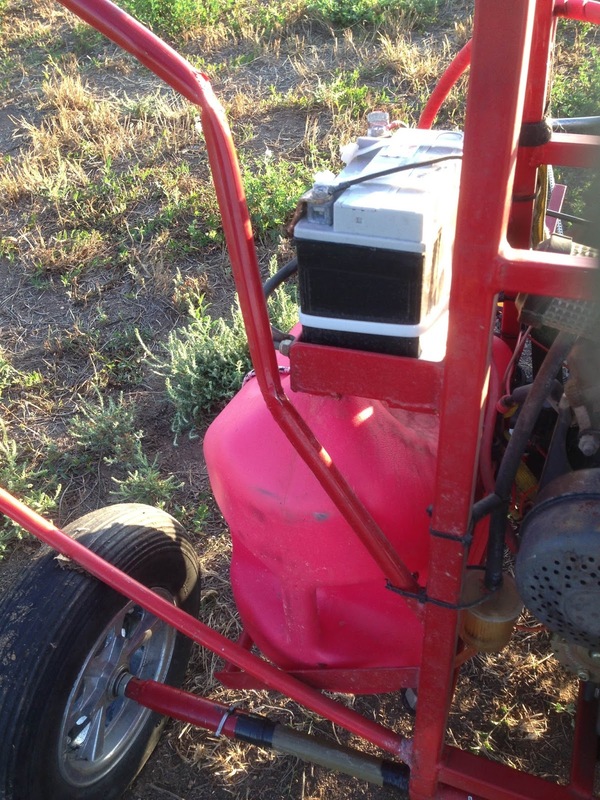 Note to self….. Take pump and full tool kit to field when you go to replace the wheel. It did seem to be coming up to full power and maybe the cable needs tightening. The weather was beautiful with blue skies and a light breeze. Beau was tied to the wind sock and I was ready to go. No cam and only the Garmin to distract me. The wing came up quick, I didn’t feel the momentary, “push me pull you”, when the wing is fully in the prop wash. I checked the mirror and there it was fully overhead and looking good. I was at full power and decided to go for it. Next thing I see in the mirror that the wing is going frontal and before I could pull some brake the lines were in the prop and it was all over. I was lazy, I should have pulled enough brake to feel the wing as soon as it passed through the prop wash. The A Assists were tight but not any tighter than the last few launches. They might have contributed to the frontal though. 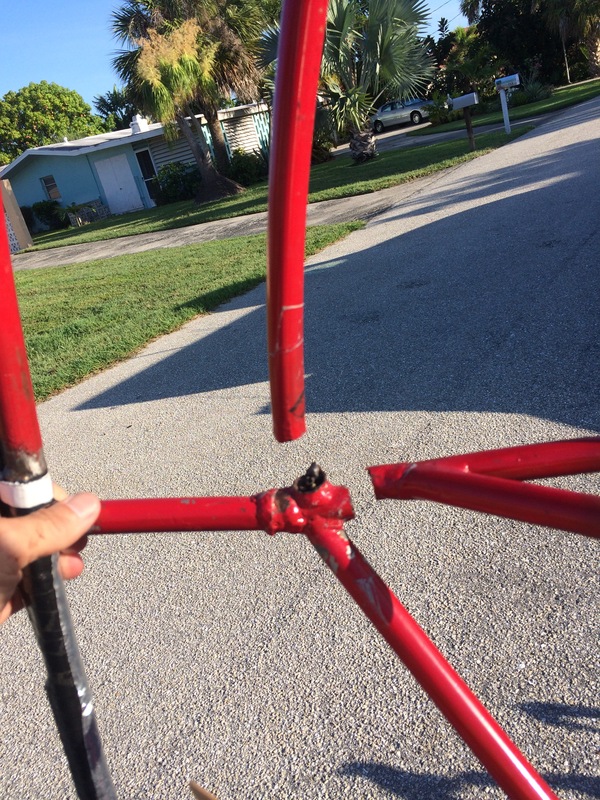 Whatever … The cage is bent in 3 places and I have several lines to replace. It’s a good thing I’ve scheduled Wednesday afternoon to do welding with Mike Bennett. We are going to replace the nose wheel and now we will repair the cage as well. Just as I was finished packing up, Marek showed up with Robert. We motored over to the South West end of the field and Marek set up to do some foot drags in the swoop pond. On his first attempt he got in a little too deep and submarine d. Luckily there was no damage to man or machine. At least nothing a little time in the sun couldn’t cure. Not a good morning for flying but it was nice to see the guys. John got in a great flight but I didn’t! Perhaps I will expand on this at a later date but suffice to say that I didn’t fly. 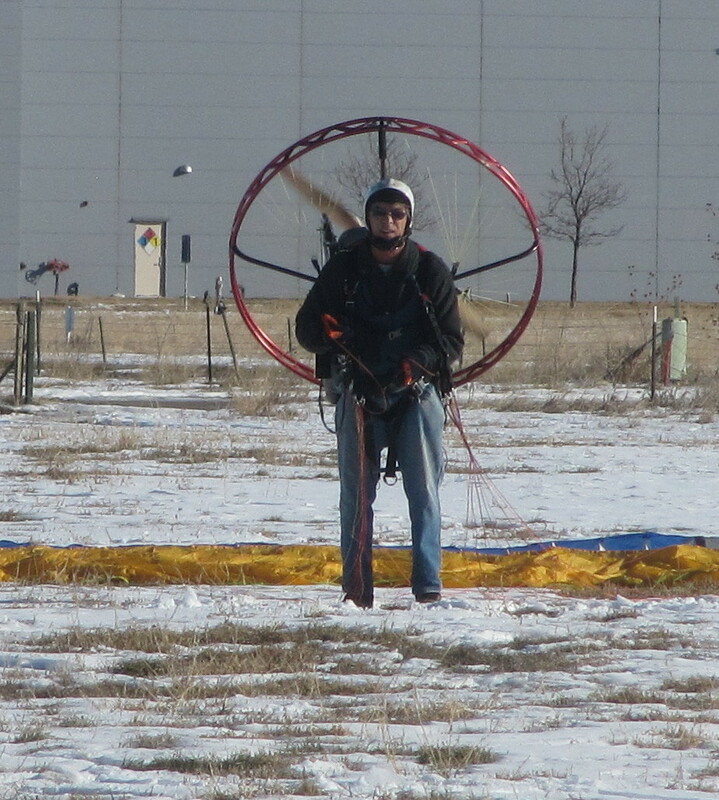 The wing and I couldn’t get together on launch until it dived into the prop. The damage was a broken line and a few small tears in the trailing edge on the top right side. I think it fell back … popped forward and fell back again into the prop wash. The nose wheel came up then down then the rear right wheel lifted enough that I though that I was going over. I killed power steered out of the tip but the prop didn’t wind down fast enough and caught the wing. The right axle was bent but the fiberglass struts were not damaged. Time to fly the PowerPlay for a bit. There was 4 inches of 3 day old snow on the field at Vance Brand. We were planning on a mid day flight despite the clear blue skies. Robert assured me that the thermals would be minor due to the cool air. 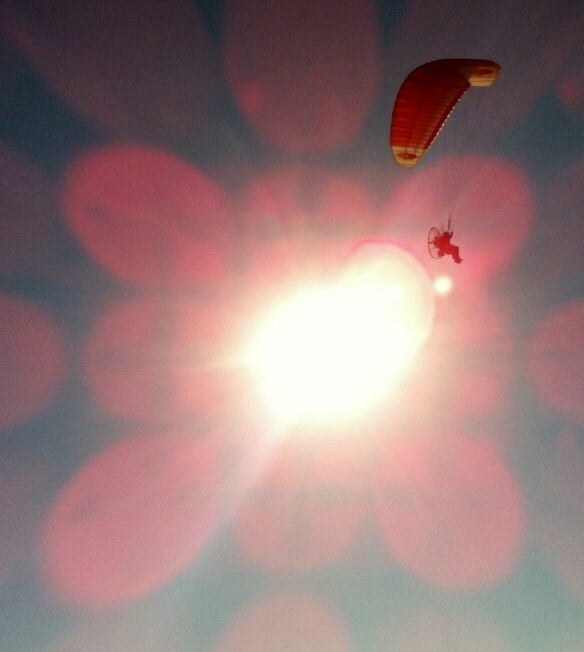 I had never flown inland mid day and was a bit apprehensive but it had been awhile and I was game to fly. So after a short delay getting gas I arrived at the field where Eric ( new pilot … student of Robert’s) was waiting to launch. He had brought his mother to see the amazing flying machine. 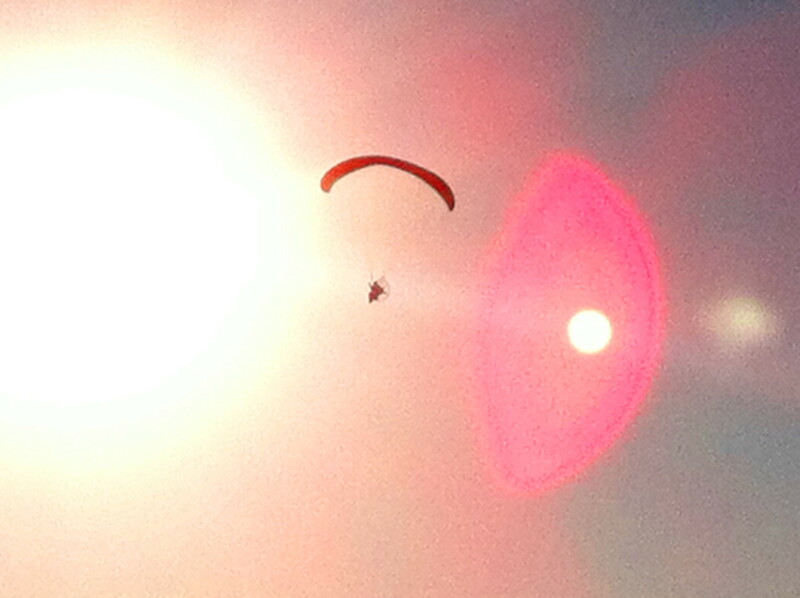 We chatted until Robert showed up and watched a stick of sky divers. They were having a great time sliding in fast and skimming along the skin of snow. My first attempt was from the pond toward the hangers. I motored up and down the course a few times to test the surface and see how the Falcon handled on the snow. The front wheel was tracking fairly well but as soon as I started a mildly hard turn the buggy would go into a slide. It was slippery and kinda fun. The CG is way behind the front wheel so when it broke loose it didn’t take much if any thrust to continue the spin. The launch was a bust. When I got close to lift off the buggy started to slide to the left. I was using minimal brake and max power. When I aborted the wing came down clean with no damage. Since there was no real breeze I layed out to try the other direction, moving 50 feet to the north to give me room to clear the swoop pond. Second attempt was the same thing. Looking at my tracks in the snow it was clear that as soon as the front wheel left the ground the trike would start torquing into a left hand turn. I set down twice to get back on track and finally aborted. The third attempt was the most dramatic. 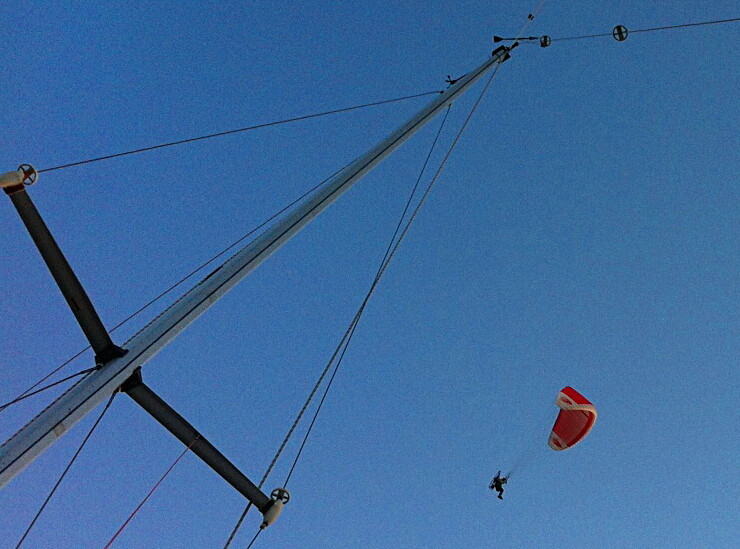 I allowed the rig to lift off and when it drifted back down I was at a dramatic heading not the same as the wing. When I touched earth the unit spun out and I was done. If it had been on anything other than a skin of slippery snow I would have rolled for sure. Remember Bubba’s? Robert said the wing was surging and falling back due to the drag of the trike as it passed through different thicknesses of snow and perhaps I would have been better off using more brakes. It might have worked but launching with brakes leads to a slow takeoff and possibly coming back down, maybe at the wrong heading for the wing. I think the “P” factor is at 2 o’clock …. pushing the trike into a left hand posture. No problem on hard surface but a bear on a slippery surface. Knobby tires on the back might have helped but I don’t think it would have stopped the left hand turn since the wheels turn independently. If I wanted to go balls to the wall I would have gone no brakes till the wheel lifted then popped up and prayed that I had enough lift to keep from touching. Risky business.